Sweatshirts are one of the most commonly used items in cold weather and are also ideal for keeping your workers warm and uniformed. In other words, personalised sweatshirts allow employees to have the same identity as a group and to wear personalised company garments. What does this mean for a company? Maximum visibility of the logo, design or image you have selected for the personalised business sweatshirts. In addition, thanks to our suppliers of personalised business sweatshirts you can find a wide variety of options of sweatshirts to personalise on the Camaloon website. 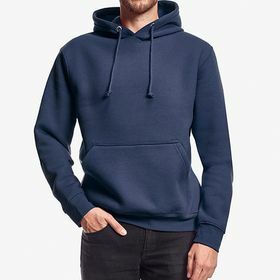 Among this variety, you will be able to choose between hooded and non-hooded sweatshirts, depending on how you prefer your winter clothing. 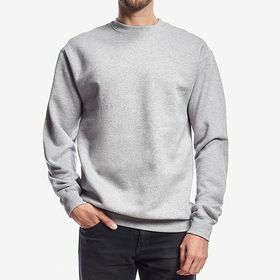 In addition, our suppliers of sweatshirts also have a wide variety of sizes, colours and materials to choose so that each garment is unique and special. 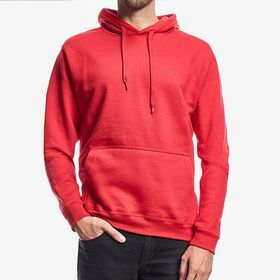 Among the materials with which you can use to create personalised business sweatshirts for your employees the 100% organic and environmentally friendly cotton stands out. Take a look at our men's personalised organic sweatshirts. In Camaloon you have everything you need to easily create your own personalised business sweatshirt designs online. Upload your company logo and design, add a phrase and use icons and templates for all occasions. This way, you'll surprise your employees and customers with the added value of personalised business sweatshirts. In addition, with these garments, you will be able to create an informal but personalised look with which your workers will feel comfortable. Merchandise sweatshirts are a hugely popular way for sweatshirts to be used and more and more companies are taking the step to use them in their promotional efforts. Combine them with other promotional items available on our website to create a great kit to go to fairs and events with.